At Lorpon we can engage three of the main human senses on the labels we print: tactile effects (touch), visual effects (sight) and scents (smell). We are able to do this using a modern twist on established techniques such as foil stamping, embossing, flexo and screen printing. Our decorative label manufacturing line is a fully digital, servo-controlled process that brings those established printing technologies to a whole new level. So let’s run down in detail what these label enhancements are and how they can bring your brand to a new level. Consumers have a psychological and physiological bias towards reflective packaging. The unmistakable quality of a gorgeously embossed hot foil stamp on a wine label sells more bottles than a wine critic’s best review. Metallic or holographic foils will attract a consumer’s eye and attention on the retail shelf. Think of the toothpaste aisle at the supermarket; the cool light diffractions of a holographic toothpaste package demand attention and conjure up bright teeth and fresh breath in consumer’s heads. Almost all major brands use some kind of metallic or holographic foil on their toothpaste boxes and tubes. According to Peterson, a very large percentage of wine labels includes metallic hot stamping foil and embossing to entice the consumer. One study he cites shows that more than 70 per cent of the time when consumers purchase wine, they don’t know the specific brand or type they are going to choose until they reach the aisle. Foil stamping is the only printing process capable of applying bright, non-tarnishable metallic effects to paper, plastic, paper board and other surfaces. 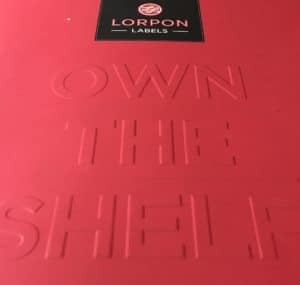 At Lorpon, we can produce multiple foil colours on the same label, in addition to extremely fine detail, as well as large solid foil areas. Foil can be combined with embossing to create a raised foil effect. It’s also available in a wide range of colors, finishes and effects: from marble, snake skin, imitation leather, pearls, wood grains and geometric patterns to holograms, pigments, metallics and subtle tints in matte and gloss finishes. We are also able to engrave and etch the foil stamped to create complex patterns that refract light in unique ways, create movement, depth and texture. This unique graphic alternative uses metallic hot stamping foil and fine engraved line patterns to impart new definition to your images. We also have the ability to print on top of the foil, if needed. We choose the best technology for our clients’ unique application. Hot foil or cold foil both perform better on different label materials and each have their place. We guide our clients through the whole process. Typesetting: It’s best to use larger type than smaller, and copy with small details can sometimes plug up. For example letters like lower case a, e, o, p or d could cause issues. Watch for fine type and tight kerning. Dieline:Foil stamping can make a label more rigid. As most labels will wrap around a bottle or container, it’s best to keep the foil stamping at least three millimeters or 1/8 of an inch away from any dieline edge. 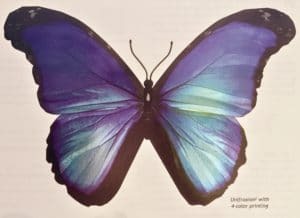 Coverage:If you are designing large solid areas of foil as well as fine detail in the same piece, it can challenge the foil material, as some are best for fine detail, and others best for medium to heavy coverage. It may take two passes or a multi-stroke process to achieve the desired result. Registration:Foil is trapped differently in different situations depending on materials, design and print processes. If the design calls for tight registration of foil to print, foil to foil, or UV coating and varnishes, consult with our sales team for production specifications. Embossing and debossing is the process of creating a raised or lowered relief effect in your labels. Using heat, pressure and the embossing die, the paper is molded to form a raised image (or debossing to yield a lowered image). 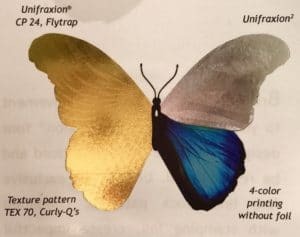 This process works best with luxurious paper materials, which are usually a little thicker, and may already have a slight texture such as felt. Embossing can be “blind,” meaning there is no printing in the embossing area. The raised effect created can have many types of variations, such as single height or multi-level; rounded edges with flat tops for larger areas, and rounded tops for thinner areas; sculptured embossing, which can create multiple heights and smooth transitions; or a combination of embossing effects with foil. By showing your layouts to our experienced sales team early on, you can avoid production pitfalls later. Typesetting: Generally, larger text sizes work better. Fill in can happen on fonts that are too small—bridging between two characters. Typefaces generally appear bolder when foiled or embossed, so don’t track or kern too tightly. It’s a good rule of thumb to set type loosely and with more leading than you might ordinarily consider. Label material:Consider choosing a paper label material that will hold your embossing well. Papers, on average, can withstand two-and-a-half times the caliper of the paper for an emboss, therefore a bulky weight paper can produce a greater embossing height. Papers that are 70 pounds or higher, felt papers and uncoated papers often work best. Also the liner or backer choice can impact embossing; generally, a filmic backer can produce a better foiling result than a craft paper backer. Also, it’s best to avoid using filmic label materials as they don’t hold the emboss well; they’re too flexible and will have memory to return to original state. Thin lines:On some designs, very thin lines can be problematic as they can crease and cut through the paper stock. This is highly dependent on the design and label materials used, so we recommend consulting with your Lorpon representative for advice and consideration. Adhesive contact:Embossing will raise the label stock away from the bottle or container it will be applied to. Depending on the coverage of the emboss, and how close to the label edge, this could be problematic. The label will not have good adhesive contact in the embossed areas, and can create bubbles and a “spongey” feeling. Also, when immersed in an ice bucket, there could be water penetration in embossed areas before non-embossed areas on the label. Dieline:As with foil stamping, it’s critical to keep embossing away from the edge of the label. The main reason for this is there will not be good adhesive contact with the bottle at the edge of the label. It can lead to flagging and lifting of the label from the bottle, which sometimes may not be apparent until weeks after application. We recommend a minimum of six millimeters of clearance, or a quarter inch from the edge of the labels. If you’re looking to take your embossed label just one step further, you might consider a gloss emboss, which is a method of combining a clear foil (similar to varnish, but deeper) with blind embossing, resulting in a high-gloss embossed image. Or, a tint leaf combination, which couples the effect of blind embossing with pastel tinting of the image. Pastel tint leaf is available in a variety of colours. Lastly, a textured emboss lends a tactile quality to embossing or foil stamping. Typical textures are pebble or woodgrain, though more are available. Not sure if we can use them but they show good effects and examples of different types of foil stamping, embossing and debossing. Contact us today to discuss how we can help you produce an embellished label that ensures your products are the ones that #OwnTheShelf.